Van Boening repeats as champion with an 8-4 win over Thorstan Hohmann in the final’s third set. The more things change, the more they stay the same. Allen Hopkins moved the 2013 Super Billiards Expo from the Philadelphia area to Edison, N.J., just outside of New York City. The April 4-7 consumer trade show that boasts a host of amateur and professional events also saw the Pro Players 10-Ball Championship switch formats — from the usual single-set, double-elimination chart to a single-elimination event that matched players in best-of-three races-to-8. But with a new venue and new format, the champion remained Shane Van Boening. The reigning Player of the Year took his fourth Pro Players title, and second in a row, with an impressive run through a field of 61. Starting with wins over Donnie Mills and Robb Saez, Van Beoning then ran into 2011 champ Ralf Souquet. The American dropped the second set, 8-6, but bounced back with a clinching 8-2 set to advance to the quarterfinals. Souquet was hardly the only big name to be sidelined early. Efren Reyes drew German superstar Thorsten Hohmann in the first round — and the Filipino legend dropped consecutive sets to end an uncharacteristically quick event. Johnny Archer, Francisco Bustamante and Mika Immonen also crashed out before winning two sets. In the quarterfinals, Van Boening took two close sets against Darren Appleton; Warren Kiamco edged Corey Deuel; Alex Pagulayan thumped Jeremy Sossei, and Hohmann outlasted Scotland’s Jayson Shaw. 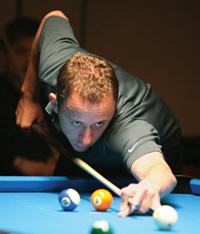 In a rematch from the 2003 World Pool Championship, Hohmann took his spot in the final by edging Pagulayan. Van Boening then topped Kiamco in straight sets, 8-6 and 8-5, to take the other seat in the championship match. Van Boening struck first in the final, taking the opening set, 8-6. He then worked his way to within a 10-ball of the title in the second when he got on the hill, 7-6. But Hohmann responded with a pair of racks to force a decisive third set. In the final race-to-8, Van Boening turned a 3-2 lead into an insurmountable 7-2 advantage. Hohmann took a pair of racks to edge within shouting distance at 7-4, but Van Boening then broke and ran the 12th table for the 8-4 win. His second consecutive Pro Players title netted Van Boening $10,000 while Hohmann pocketed $5,000 for his runner-up finish. With three players left in the Derby City Classic’s 9-ball division, Shawn Putnam caught a bit of a break when he received the bye into the final, leaving Mike Dechaine and Alex Pagulayan to play in a de facto semifinal, with both players already having exercised their buy-back options. Dechaine, fresh off a dominant 9-2 victory over Shane Van Boening, kept pace with Pagulayan. With the 9-ball event extending races to nine racks, a change to meet BCA-mandated specifications for points events, Pagulayan and Dechaine met on the hill, 8-8. Following an exchange of safeties, the Filipino hit a table-length kick on the 1 ball on his way out, securing his spot alongside Putnam. And while Putnam kept pace with Pagulayan, the Lion proved too much for the 41-year-old American. 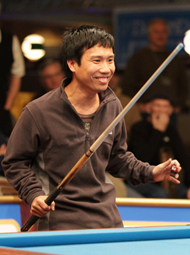 After Putnam closed to within a rack at 7-6, Pagulayan forced his opponent to foul in each of the next two racks to take the $16,000 title by a final count of 9-6. With that victory, Pagualayn capped the 15th Derby City Classic where the majority of the big prizes went to the always-formidable Filipino contingent. Francisco Bustamante, winner of the banks division and runner-up to Corey Deuel in one-pocket, took home the $20,000 Master of the Table all-around award. Dennis Orcollo, meanwhile, snapped off the Bigfoot 10-Ball Challenge to pocket the $20,000 first prize. VIRGINIA BEACH, Va. — Heading into the final two days of the 2012 U.S. Open 9-Ball Championships, it’s clear that the strong have survived. At the conclusion of play on the winners side on Thursday night, just eight players remained. And that octet packed plenty of star power. Former champions Shane Van Boening, Alex Pagulayan and Johnny Archer are all chasing title No. 2. 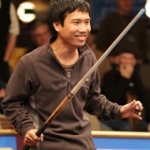 But in perhaps the most thrilling story of the U.S. Open to this point, 58-year-old Efren Reyes strung together five victories — including an electrifying 11-10 win over two-time defending champ Darren Appleton — to put himself in contention for the Open crown. He will square off against countryman Dennis Orcollo on Friday. Pagulayan and Archer will square off in the other match on that side of the bracket. Scotland’s Jayson Shaw will face 63-year-old Jose Parica on the other side of the bracket. Parica, runner-up at the 2003 U.S. Open, advanced via a dominant victory over a resurgent Earl Strickland, 11-5. The winner of that set will then face the victor in Shane Van Boening’s match against Ronnie Alcano, a rematch of the 2007 U.S. Open won by the American. While eight players have two bullets left in their revolvers, the left side is packed with championship-caliber talent. Most notably, late Thursday evening, Darren Appleton trailed American Oscar Dominguez. In search of his third-straight title, the Englishman was struggling to rally in the second match after his heart-breaking loss to Reyes. Leading the charge on the one-loss side, Japan’s Yukio Akagariyama, China’s Li Hewen and Taiwan’s Chang Jung-Lin are major title winners seeking glory on American soil. Europe’s Albin Ouschan, brother of women’s star Jasmin and rising star on the EuroTour, joins England’s Chris Melling in the title hunt. American hopes settle on Corey Deuel, who dropped a Thursday night set to Jayson Shaw, and five-time titlist Strickland. Jubilant shouts and the deep thud of cue butts slamming the floor echoed through the Venetian Hotel and Casino on Thursday night as 18 pool players took another step closer to the $350,000 top prize at the $2 million IPT North American 8-Ball Open – and another 18 saw their dreams cut short. “Haalllloooooooo!” cried Efren Reyes, as he sank the winning 8 in a must-win hill-hill match against Mick Hill of the U.K., and pumped his fists to the ceiling. He punctuated his triumphant shout with a relieved chuckle, as he watched the cue ball come an inch from scratching in the corner. “YES!” shouted Englishman Darren Appleton, upon hearing that bracket imate Cory Deuel had lost his last match of the day, leaving the door open for his own ascension into the next round. “Thank you! Thank you! See you tomorrow, everybody! Yiiiii yiiiiiii!” shrieked Ronato Alcano of the Philippines, after his stats were posted on the official scoreboard and he saw that he beat America Dee Adkins for the third sport in his bracket by a percentage point. After a 12-hour day of round-robin play, the field of 36 players in round four winnowed to 18, who were guaranteed $30,000 each by virtue of advancing to the fifth round of play. Their 18 eliminated compatriots pocketed a none-too-shabby $17,000. The Filipino contingent continued its dominance and bettered it chances for claiming the championship, placing seven players in the last 18: Reyes, Alcano, Francisco Bustamante, Marlon Manalo, Dennis Orcollo, Alex Pagulayan and Rodolpho Luat. As the clock rounded 8 p.m., it was gut-check time for several players who had recorded records of 2-2 and needed a win in their final match for a shot at advancing. Players took their turns in front of the tournament’s billboard-sized scoreboard, nervously drawing numbers in the air as they tried to figure out the calculus of the bracket and how they would fare in different scenarios. Players on the bubble with 2-2 records included Reyes, matched against Hill (1-3); Alex Pagulayan, playing against fellow Filipino Dennis Orcollo (3-1); and Deuel, set against Filipino Marlon Manalo (3-1). Matches that paired players with identical 2-2 records included Frenchman Yannick Beaufils vs. Niels Feijen of the Netherlands; American Earl Strickland vs. Alcano; and Francisco Bustamante vs. Santos Sambajon, both of the Philippines. American Gabe Owen was stuck in a must-win position from the third match of the day. He faced fearsome Filipinos Bustamante and Sambajon in his first two matches and lost both of them. He needed to win the next three matches to have a hope of advancing. “I just thought, screw it – just let it go. You only live once, just do it,” Owen said. He proceeded to beat Reyes, 8-6; then Hill, 8-6; and in the longest match of the fifth set, Ivica Putnik of Croatia, 8-5. Sinking the last 8, he yelled and pumped his fist at jackhammer speed. “My feet are killing me,” he said afterwards. Stalev of Russia already knew what he would do with the $350,000. “I promised my friend [IPT member] Fabio Petroni that we would go on a vacation to Hawaii with five girls,” he said. Stalev was one of the few players whose record was strong enough by early evening to count on advancing. Others were not as lucky. “The pressure … the pressure … the hunger … I’m so tired,” said the rail-thin Alcano after squeaking by Strickland, 8-7, in their 8 p.m. match. He tossed his cue in the air, caught it and then did a stiff jig as Strickland packed up his cue case and ignored repeated requests for an on-camera interview by IPT staff. Even countryman Reyes, perhaps the best big-money player in history, felt the pressure and dogged several shots in his 8-7 win against Hill. He often appeared listless and confused, and several observers opined that the rugged, five-match-a-day schedule was getting to the 51-year-old Hall of Famer. LAS VEGAS, Nev. – Despite some strong opposition from European players, including the surprising contingent of English 8-ballers, the always tough Filipinos are dominating the history-making IPT North American 8-Ball Open. Virtually every Filipino competitor who started in the 200-player field has made it through to the 36-man fourth round of play – nine altogether, including three Pinoy hopefuls who needed to win qualifiers to gain entry to the $2 million tournament. Leading the pack, as usual, was legendary Efren “Bata” Reyes, whose overall record stood at 12-1 after three days of round-robin play. No less impressive was the ball-control mastery of Filipino Marlon Manalo, who held an identical 12-1 record, along with Germany’s Ralf Souquet and Rafael Martinez of Mexico. Third-round play began on Wednesday at the Venetian Hotel and Casino with the remaining 60 players divied into 12 groups of five. The top three in each group would advance to the fourth round on Thursday with a guarantee of at least $17,000 in prize money; the eliminated players would collect a still-impressive $10,000 each. USA: Dee Adkins, 4-0; Jason Kirkwood, 3-1; Earl Strickland, 3-1; Cory Deuel, 4-0; Shawn Putnam, 3-1; Rodney Morris, 3-1; Larry Nevel, 3-1; Gabe Owen, 2-2; and David Matlock, 2-2. Philippines: Efren Reyes, 4-0; Marlon Manalo, 4-0; Francisco Bustamante, 2-2; Dennis Orcollo, 3-1; Antonio Lining, 4-0; Rodolfo Luat, 2-2; Alex Pagulayan, 3-1; Santos Sambajon, 2-2; and Ronato Alcano, 2-2. United Kingdom: Rico Diks, 2-2; Raj Hundal, 1-3; Daryl Peach, 2-2; Darren Appleton, 2-2; Mick Hill, 3-1. Netherlands: Niels Feijen, 3-1; Alex Lely, 3-1; and Nick Van den Berg, 3-1. Germany: Ralf Souquet, 4-0; and Thorsten Hohmann, 3-1. Other countries: Quinten Hann (Australia), 2-2; Ivica Putnik (Croatia), 2-2; Mika Immonen (Finland), 3-1; Sandor Tot (Italy), 2-2; Yannick Beaufils (France), 2-2; Rafael Martinez (Mexico), 4-0; Evgeny Stalev (Russia), 2-2; and Marcus Chamat (Sweden), 3-1. * The biggest eye-opener for many established players at the Open has been the success of the top competitors on the English 8-ball circuit, including perennial champions Mick Hill and Darren Appleton. Both will compete in the round-of-36. Among their strengths are excellent cue ball control and solid stroke mechanics, said observers. “Those guys shoot very straight, and I can respect that,” said IPT member Ike Runnels. * Fifteen women started the competition on Sunday, and only former snooker stars Allison Fisher and Karen Corr were given much of a chance to advance. One woman was able to infiltrate the third round, and she was a U.K. native, but no one you might expect. “I sort of in a way proved a point,” said Sarah Ellerby, who collected dozens of 8-ball titles in England before coming to the U.S. to compete on the WPBA Classic Tour. “…There wasn’t as much attention on me as on the other girls, and that’s fine. Unfortunately, Ellerby fell into a tough bracket in the third round and finished with a 1-3 record. Knowing she wouldn’t advance, Ellerby immediately left for the Las Vegas airport to catch an 11:30 p.m. United Airlines flight to Chicago. There, she would catch a limo for a two-hour drive to Peoria, the site of the WPBA Midwest Classic, which was starting play Thursday morning. “I’m going to be very tired,” she said. * Staying on the English for another moment, sharp observers might note that Raj Hundal advanced with a 1-3 record. It’s no misprint. Hundal was in a bracket with players who posted 4-0 and 3-1 records (Reyes and Strickland), leaving the other three players with 1-3 tallies. Of the three, Hundal had the highest games-won percentage (56.49 percent, just over American Gary Abood’s 55.09 percent), which pushed him into the next round. That 1.4 percent difference was worth at least $7,000. * Another surprise at the end of the day was how many players who were forced to qualify for the event ended up in the round-of-36. The 200-player field offered 50 qualifiers, and no fewer than nine made it into the fourth round. They included Filipinos Luat, Sambajon and Alcano. * Most of the favorites remained in the running for the fourth round, with one major exception. American Johnny Archer faded in his bracket, finishing with a 1-3 record.